Investments in large, expensive, long-life assets involve significant uncertainty about the availability, in reasonable volumes and at acceptable prices, of inputs to sustain commercial operations and of markets for their outputs. Liquefied natural gas (LNG) processing plants are like this, with capital costs in billions of dollars and operating lives exceeding 20 years. Downstream purchasers of gas are in a similar position, as they must invest in facilities for regasification, power generation or petrochemical production. Companies use contracts to provide a degree of commercial certainty in these circumstances, but knowing where to set terms and conditions that will provide adequate protection can be difficult. The terms and conditions must be relevant and useful to all contracting parties over a horizon of perhaps 20 or 25 years. This case study shows how a straightforward set of medium-term scenarios was used to help an LNG seller to anticipate what might happen in the future so it could draft appropriate terms and conditions, including conditions precedent, for a long-term contract, requirements that must be satisfied or waived before all the terms of the contract become fully operational. Liquefied natural gas (LNG) requires large investments at many points in the value chain. There are often many stakeholders, all of whom want to reduce the risk to themselves of significant investments in major plant and facilities. This is usually effected by means of a gas supply and purchase agreement (GSPA) between the seller and the buyer and, where the LNG is to be used for purposes like power generation or petrochemical production, additional agreements between other downstream stakeholders. GSPAs are critical for both sellers and buyers, as the contractual horizons frequently exceed 20 years to match the lives of the plant and equipment involved. It is not always possible to formalise all the necessary agreements quickly or at one time. GSPAs and associated contracts often contain conditions precedent, requirements that must be satisfied or waived before all the terms of the contract become fully operational. This allows commercial arrangements to be agreed in sufficient detail to allow other investment to be initiated before the complete commercial structure has been finalised. Each of the power generators has long-term PPAs in place with creditworthy electricity retailers. Legal opinion about the efficacy of such conditions precedent is divided. One view is that a financing plan that includes provision for appropriate PPAs is sufficient, while another indicates that a signed PPA would be required. In practice it is rare that PPAs are agreed quickly or for the full power generating capacity, so waivers or amendments to the conditions precent are often required. In this case there was a general view that having PPAs in place as envisaged in the conditions precedent would be a benefit to the seller, although there was considerable debate about their commercial effectiveness should serious contractual non-performance arise. PPAs would provide negotiating leverage should it become necessary and they would protect against defaults by individual generating companies. However, there was a consensus view that PPAs would not protect against regulatory changes and that country risk was known and accepted by the seller at the time the GSPA was negotiated. LNG GSPAs typically allow the buyer to adjust the volume of gas delivered under the contract, within specified limits, to cater for marginal increases in demand (upward flex) and decreases in demand (downward flex). Medium-term to long-term actions, focussing on scenarios with a time horizon of 10-15 years. Identify and discuss feasible options for addressing the most important threats and opportunities. A simplified form of the short-term decision structure is shown in Figure 2. The buyer had been asked to provide financing plans, but it was anticipated that they would not satisfy the conditions precedent to the extent required by the seller. Discussion centred on the current commercial imperatives for the seller over the next 18 months that might impose restrictions on its options. In particular, attention was focussed on how far the seller could delay a decision about the conditions precedent without severe pain, and whether there might be opportunities associated with delay. Some of the specific matters and the discussion are summarised in Table 2. There was a technical condition in the shipping contract that required an unconditional GSPA, but the timing for this could be extended. An unconditional GSPA would be needed by the time of the next scheduled payment. Delay in the GSPA would delay the shipping contract, and in turn delay the delivery of the vessels, increase direct costs and incur opportunity costs associated with the loss of operational flexibility in shipping. An unconditional GSPA was a key requirement for a decision to proceed with the construction of another LNG train. An unconditional GSPA was needed to enable the seller to reverse a hedge deal for commercial and operational flexibility and to manage other key risk exposures. Without an unconditional GSPA, the seller would be unable to book the profit on the sale and reserves would need to be de-booked, with impacts on corporate credibility and knock-on effects on the share price. More time would be available for further negotiation with the buyer, although the benefits of this were uncertain. The buyer was keen to have PPAs in place, but it recognised that this would be difficult to achieve in the short term. However, it wanted the requirement to remain in place, to keep pressure on its customers, the power generation companies. The buyer's project financing was unlikely to be conditional on PPAs being in place as construction of the unloading terminal had started. The buyer's customers (the power generators) were not concerned about PPAs in the short term, as they believed existing power shortages would help to resolve any problems. Their finance was thought to be non-recourse. A number of the matters discussed in Table 2 were not specific to the resolution of the PPA condition. Although they were raised in that context, they reflected project-wide imperatives to achieve an unconditional GSPA in the near future. While the PPA issue was an important one, it was not the only matter that required resolution in a timely manner. It was agreed that a deadline would need to be set by which a waiver of the conditions precedent would have to be agreed, or some other action taken having a similar effect. In practice, a decision would be needed quickly to allow appropriate corporate actions to be undertaken. Four outline supply and demand scenarios for electricity were developed to structure the medium-term assessment. The structure for the associated discussions is shown in Figure 3. When assessing the threats and opportunities associated with a scenario, a set of risk rating scales was used to provide consistency. 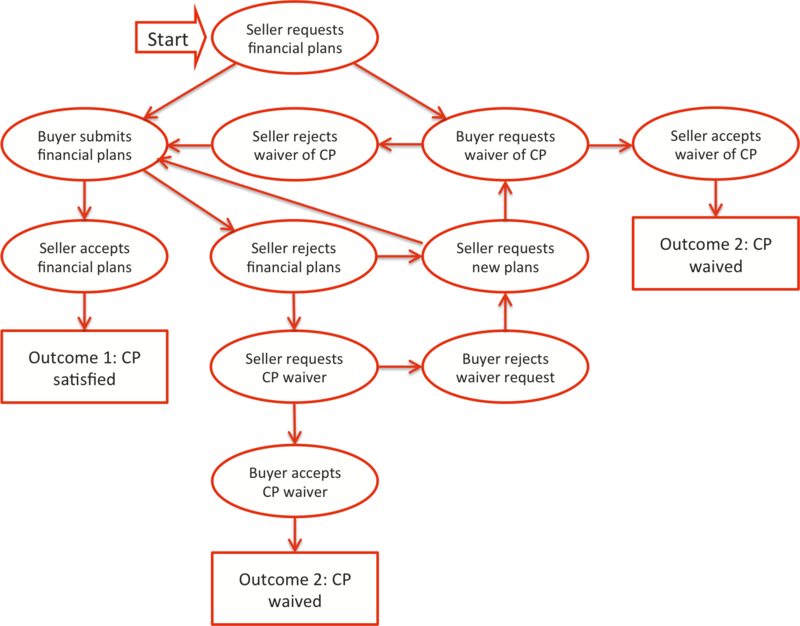 The scales were based on those used by the seller as part o its enterprise risk management (ERM) framework, adapted for this task. Outline supply and demand scenarios were developed, summarised in Table 3 and Table 4. New generators come on stream, including new peak-load and mid-load suppliers with efficient, cost-competitive plants. New inter-regional grid connections are constructed, bringing cheap coal-fired base-load power. Planning and environmental restrictions may limit the growth in supply in the short term. Electricity generation capacity in the region rises as forecast, with moderate increases in inter-regional supply. For present purposes, assume the low case supply forecast from the Government Energy Commission. New generators are not commissioned as quickly as planned, and there are few substitute sources of electricity. Inter-regional supply does not increase to any significant extent above current levels. It is physically impossible to meet all regional demand. GDP growth continues at or near projected rates, but demand management strategies are not as successful as hoped and energy efficiency does not increase much. Electricity demand rises strongly, faster than anticipated in regional forecasts. GDP growth is close to forecast levels, demand management strategies are successful, and electricity demand grows in line with forecasts, below the GDP growth rate. GDP growth slows below forecast rates, demand management and energy efficient initiatives are successful, and electricity demand eases, with slower growth rates in electricity use. Electricity demand exceeds supply by a significant amount. The generators using our gas meet or exceed their despatch expectations. There are few worries for the seller. It is likely that the upward flex allowed in the contract would be exercised, with associated benefits. Electricity supply and demand are more-or-less in balance. There is competitive pressure on generators using our gas, but they are able to meet or achieve close to their despatch expectations. No contractual problems are likely, but there may be operational problems if downward flex is required. It may be possible to divert unwanted gas elsewhere, either by the buyer or us. After the use of all flex capacity, LNG could be diverted to other terminals. Electricity supply exceeds demand, creating competitive pressure on the generators using our gas. There is pressure on mid-load supply. Assume downward flex is used, and LNG could be diverted to other terminals. In the worst case the seller loses cargoes (which are sold at distressed rates), for several years. There is gross over-supply of electricity to the region, and the generators using our gas lose customers, putting pressure on both mid-load and peak generation. Assume downward flex is used, and LNG could be diverted to other terminals. This could lead to contractual non-performance. Realistically, this scenario would be expected to follow Scenario 3, although there are precedents for Scenario 4 to arise alone if there were to be a market meltdown. The worst case would be the loss of half the sales revenue, with a three-year lead time to establish alternative long-term contracts, allowing for diversion of at least some of the LNG to the spot market. Participants took a conservative view of the possible outcomes to compensate for their uncertainty about the future 10 to 15 years hence. The scenario was rated higher to avoid it being ignored and to allow for other unknown circumstances that were not considered in the workshop. The supply and demand scenarios were developed in relation to general electricity market conditions in the region, whereas the specific scenarios in Table 5 were related to the seller and the GSPA. Because the effects of the supply and demand imbalance in Scenario 4 have a differential effect on gas-fired power generators, the consequences would be more severe for them, and hence they would have a large effect on the seller. The raised probability rating was an additional (and possibly excessive) allowance for the increased severity. The threats and opportunities associated with Scenarios 2, 3 and 4 were identified. Although some opportunities were identified, the focus was on threats, as it was against the threats that the conditions precedent and the PPA requirement were intended to provide a measure of protection. Scenario 1 was ignored, as there were few threats for the seller associated with it. The main causes of each threat and opportunity were noted, with any controls that were currently in place, and their anticipated effectiveness. The consequences of each threat or opportunity were assessed for each scenario, taking into account the existing controls and their anticipated effectiveness. The gross exposure of seller in the relevant scenario (if the controls failed or were ineffective) was used as an initial estimate of the severity of the risk and adjusted where necessary. The likelihood of the identified level of consequences arising was assessed, should the seller be exposed to the threat or opportunity within the relevant scenario. Eleven threats and opportunities were identified and their levels of risk were calculated for each of scenarios 2, 3 and 4. The buyer exercises full downward flex, and we can't get a ship to take the LNG to another market, so we lose cargoes to the spot market. This risk also appears in Scenario 3. The buyer is unable to meet its take-or-pay conditions, so we have excess supply and possibly production and scheduling problems. We are asked to reduce price or volume. Government regulations require power to be generated based on the natural merit order of generating costs, so gas-fired power becomes less competitive and demand for our gas reduces. The buyer asks us to reduce our LNG price, and we may have to renegotiate on volume or price or both. Increase in market demand in the region leads to the buyer exercising upward flex, and potentially other sales as well. Government regulation encourages gas-fired power plants (e.g. for environmental reasons), leading to increased demand for LNG. If deadlines were to be met, then there was significant time pressure to negotiate the GSPA successfully. The negotiating strategy had to recognise the deadlines, and it should contain contingency plans to be implemented if a delay seemed likely. If the GSPA contained other conditions that might be contentious and delay a negotiating outcome, then it might be prudent to separate the PPA condition precedent and negotiate it independently and in advance. If that did not seem feasible, then a waiver might be needed anyway, and it would be wise to prepare for this less desirable outcome too. In the longer term, options for maintaining market and operations flexibility should be pursued, to allow the seller to deal successfully with a reduction in LNG taken under the GSPA. This set of options was concerned with maintaining operational flexibility to respond to a reduction in demand, whether it was a downward flex permitted in the contract or a potentially more severe reduction associated with a default or near-default event. Direct or third party credit enhancement should also be examined. A number of options for forms of credit enhancement were considered. Some would require renegotiation of the contract, while others were not dependent on the buyer. All would have costs associated with them, but they were worth investigating. There was a general view that government intervention was highly unlikely and that seeking it would not be recommended. Straightforward scenarios were sufficient, in this case, to deal with what at first appeared a complicated multi-faceted situation. A high-level view of the commercial uncertainties was vital, but detail and precision was not needed to reach the main commercial decisions. Although the scenarios were simple, they contained enough detail to be realistic and to support meaningful discussions. They provided a framework for working through the situations the business could face and to identify and analyse relevant threats and opportunities. The seller’s ERM framework was familiar to everyone, so the analysis and evaluation of the threats and opportunities was relatively easy. 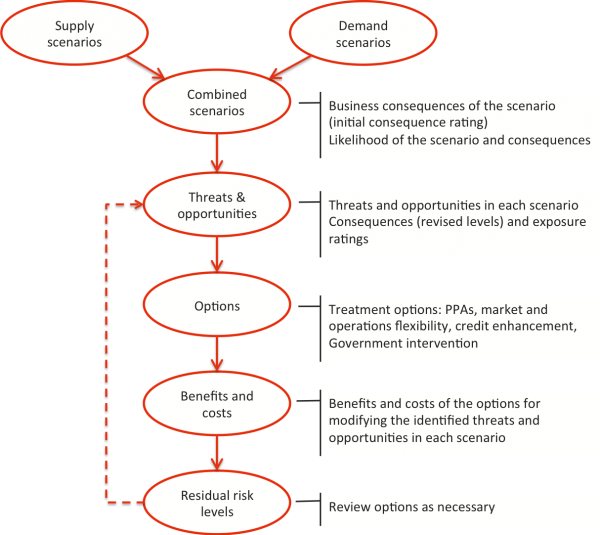 Only minor changes to the process were needed to incorporate the scenario approach. Despite the apparent complexity of the contract arrangements and potential outcomes, a simple qualitative risk rating system enabled the problem to be understood sufficiently for logical solutions to be developed. There was no need to resort to more complicated (and costly) quantitative approaches. This case study concerns the construction of an import terminal for liquefied natural gas (LNG), planned as a conventional onshore receiving LNG terminal with storage tanks and regasification facilities. An enhanced risk assessment process was used and treatment options were developed. A multi-national consortium was in the early stages of investigating a proposed gas-to-liquid (GTL) project. We facilitated workshops to identify and analyse the main uncertainties associated with the project. There were several objectives: to contribute to the tollgate submissions and approvals processes of the consortium partners; to enhance the quality and focus of bid preparation; and to provide a forum for communication and enhanced understanding between the partners.